Tickets are available now for Hamilton at the Richard Rodgers Theatre on Broadway. Everyone wants to be in the room where it happens… and who could blame them?! Hamilton is simply the smash hit of the century, creating a level of hysteria unmatched by anything else the Great White Way has to offer. Having premiered off-Broadway at the Public Theater in February 2015 to a sold out limited engagement, Lin-Manuel Miranda’s juggernaut musical quickly made the leap uptown and began previews at the Richard Rodgers Theatre on July 13, 2015, and opened to rave reviews on August 6. 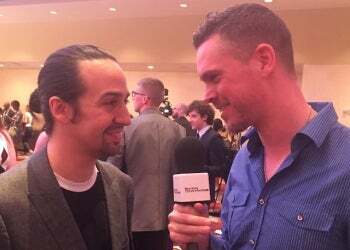 Fast forward one year and Hamilton receives a record-breaking 16 Tony Award nominations and ends up tying The Producers with a total of 11 wins, including “Best Musical”. The original Broadway cast recording, which won the Grammy Award for “Best Musical Theater Album,” reached number 3 on the Billboard charts at one point, with “The Hamilton Mixtape” debuting at the top spot in December 2016. The show’s creator and original leading man Lin-Manuel Miranda was already known in the Broadway theatre community for his work on In The Heights and Bring It On – The Musical, but Hamilton propelled his status into the mainstream of American pop culture. There wasn’t a month that would go by without Miranda gracing the cover of a top-selling magazine or welcoming A-List celebrities and politicians backstage after various high-profile visits to the Richard Rodgers Theatre. Hamilton also made top Broadway stars out of original cast members Leslie Odom, Jr., Renée Elise Goldsberry and Daveed Diggs (who each took home a Tony Award in their respective categories), as well as Phillipa Soo, Christopher Jackson and Okieriete Onaodowan. All original principal cast members have now left the Broadway production, but that hasn’t stopped fans who continue to flock to the theatre for sold-out performances. Miranda’s idea to tell the story of Alexander Hamilton through the genre of Hip Hop (with generous helpings of RnB) by a multi-racial cast captured the imagination of Americans coast to coast. For the younger demographics still at school, Hamilton would become the most revolutionary and exciting History lesson they would ever attend. The musical combines 18th century-inspired, Tony-winning costumes by Paul Tazewell and slick, modern, Tony-winning choreography by Andy Blankenbuehler to create a fresh, Broadway production to appeal to those outside the Broadway community and hardened theatregoers in equal measure. If you are yet to witness “The Story of Tonight,” then take your shot and secure your tickets today! Your Obedient Servant, the New York Theatre Guide. He's in the room where it happens! Austin Scott makes his Broadway debut tonight as he reprises his role of Alexander Hamilton from the show's National Tour in the Broadway production at the Richard Rodgers Theatre. Michael Luwoye played his final performance in the role on February 17, 2019. Mr. Scott's previous stage credits include Lin-Manuel Miranda's In the Heights, as well as Rent, Sunset Boulevard, Beauty and the Beast, and Hairspray.